Everyone in the rescue world is familiar with the concept no paws on ground. Puppies need 3 rounds of shots before they are fully protected from diseases that they can pick up from other dogs. Until the puppies have had at least the first 2 rounds of shots, they could get very sick and even die if they are allowed to touch the ground where other dogs have stood. The biggest risk is parvo, which is rampant in the St. Louis area where I live and across the country. Once dogs have had their shots, they shouldn’t contract parvo even if they walk in an area where an infected dog has been. Older puppies and adult dogs can receive the full protection in a single round of shots, so these dogs can be taken on walks immediately after they have had their shots. But baby puppies have to get their shots in a 3 step process (not including the rabies shot which comes later). For that reason, baby puppies should NEVER be taken to a park, pet store or on a neighborhood walk before they have had their shots unless they are carried the entire time. When I signed up to foster, I knew about the no paws on ground rule for puppies, but didn’t realize how challenging it would be for me to deal with walks. Jojo and Sylvie came home with me when they were just 6 weeks old. I had them for 3 weeks while I waited for them to be old enough to get their first 2 rounds of shots and get spayed and neutered so they could go to their adoptive homes. What I didn’t really think through is how I would deal with walking my dog Milo and keep their little paws off the ground. All it took was one day for me to realize that carrying two squirming puppies while walking another dog wasn’t going to work. I live in a condo without a yard, so Milo needs to walk 3 or 4 times a day. It’s amazing how heavy those tiny puppies got after a few minutes. Plus picking up Milo’s poop with two puppies in my arms was almost impossible. While I could have left the puppies at home in a crate when I took Milo for his walks, I really felt it was important for them to get some fresh air and be exposed to as many new experiences as possible. I first considered buying a baby carrier, thinking it would be big enough for both of the puppies, and would free up my arms. Then a neighbor suggested a shopping cart. When she lived in California years earlier, she had a friend who took her small dog to the beach in one of those shopping carts you see elderly people using so they don’t have to carry groceries home. I found the perfect shopping cart at The Container Store. I actually looked at a few grocery stores first, but all of their carts had large openings on the sides that a puppy could easily crawl through. This cart had much smaller openings to make the cart sides escape proof. Since the bottom of the cart wasn’t solid, I placed a towel in the cart to give them a soft bottom to sit on. 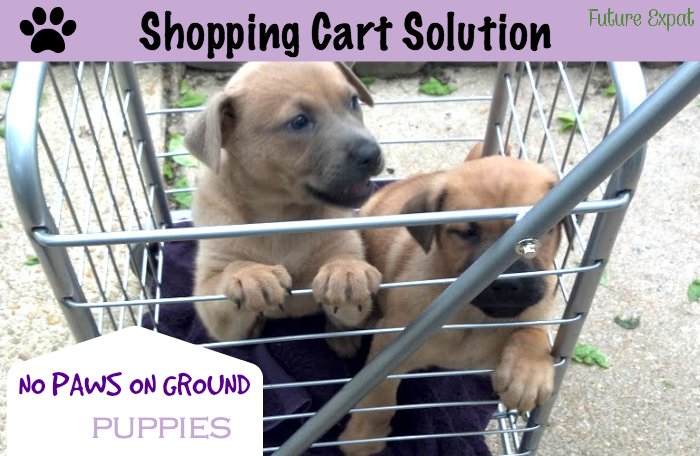 The puppies easily fit in the cart and were safe from any germs that could get them sick. They quickly learned to use the bars to stand up and get a good view, and only occasionally forced their heads between the rails. They did learn to climb out pretty quickly, but I would just give them a small bop on the head when they started climbing and they learned to stay put. On long walks they would even lay down on top of each other and take a nap. Milo really didn’t like all of the attention they received, but he was a trooper. It was only a few months after I adopted Milo when I fostered Jojo and Sylvie, and I quickly learned he could be trusted to stay put if I had to drop his leash to deal with them. He even learned to help when I yelled out ‘go get the puppy’ when one would manage to climb out while my head was turned. Milo would run after the puppy, then I would call him to come back. The puppy would of course want to follow the bigger running dog and I could scoop it up. To this day, I call all dogs puppies and Milo gets excited when we see a fully grown “puppy” on our walks. The cart turned out to be a great adoption tool too. 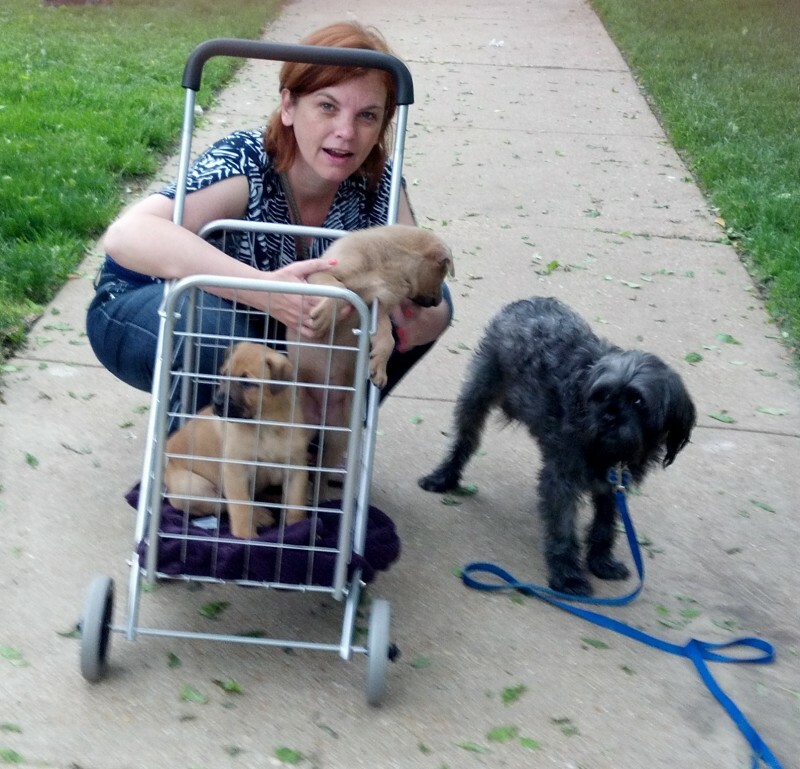 EVERYONE who saw me pushing a cart with 2 puppies stopped to ask about them. Inspiration for this post came from Fidose of Realty and Stylish Canine’s #dogswithcarts Instagram contest. When I first bought the cart, I planned to write a post about it, but somehow it never happened. Thanks to the contest, I dug out the pictures and started writing. I am soooo sharing this – love it and such great advice. Plus #DogswithCarts is a win win! YAY! This is brilliant! And it’s an inexpensive solution that is so accessible for people in any area – so much easier to find a cart like this than something custom for a dog, and many folks might already have one in this house. Not to mention, quite reasonable when you might not use it for puppies that long! Love this post. 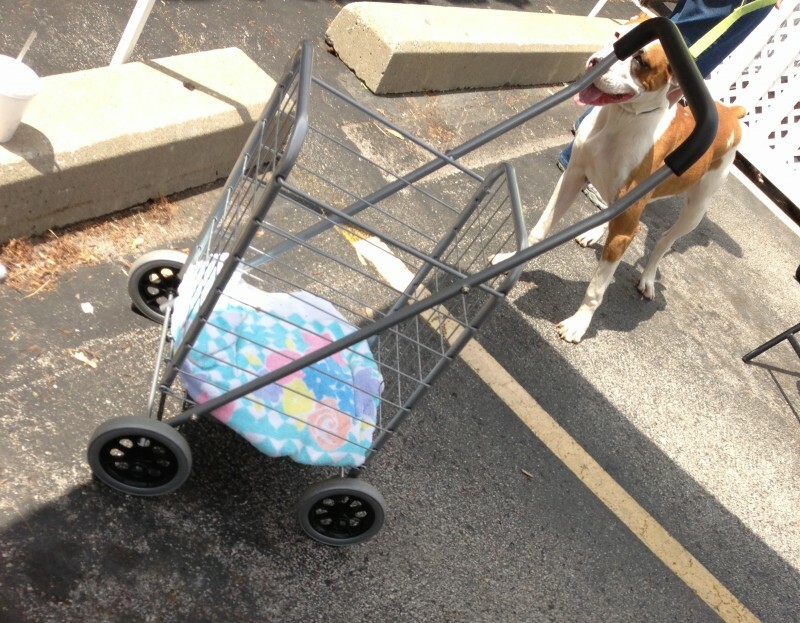 Plus, it’s an entry into the #DogsWithCarts contest – bonus! I agree that the cart is a much more practical option for puppies that will outgrow a stroller and really only need a way to ride for a few weeks. Plus, if the puppies do get sick with anything, the metal cart can be easily disinfected. What a great idea! Those puppies looked like they were a handful. 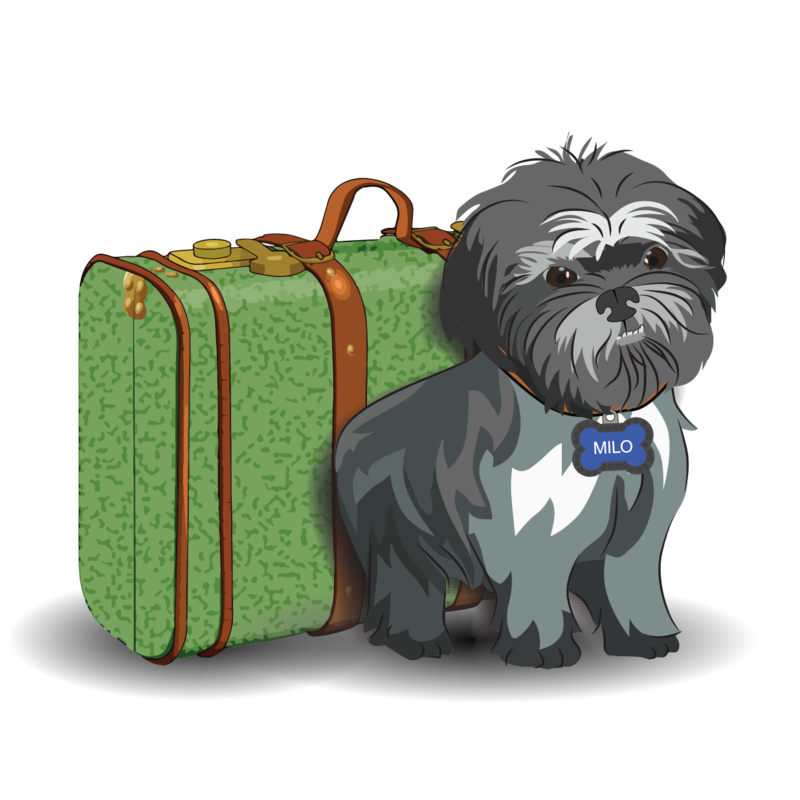 I love how Milo helped guide those puppies back to you. What a lovely story. What a good solution! 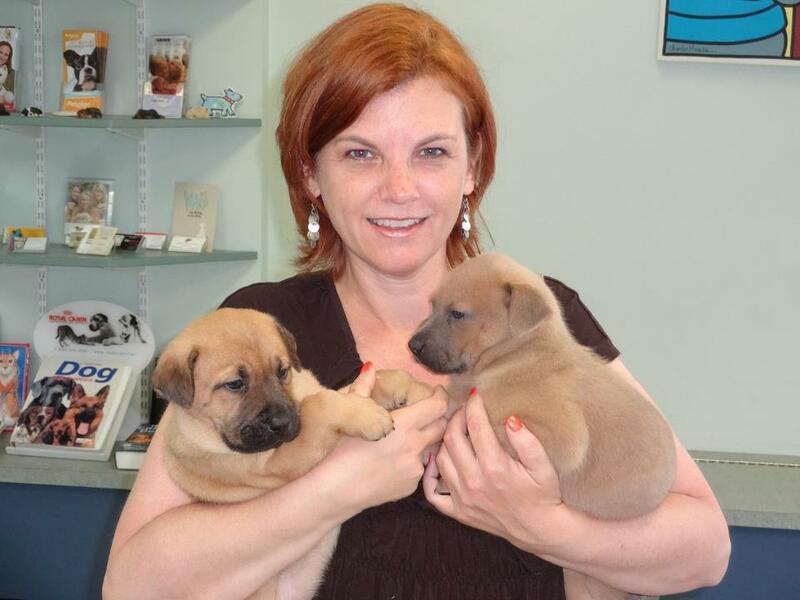 My mom fosters puppies for Stray Rescue of St. Louis. Luckily, she has a yard so the puppies don’t have to go out in public until after they’ve had their shots. 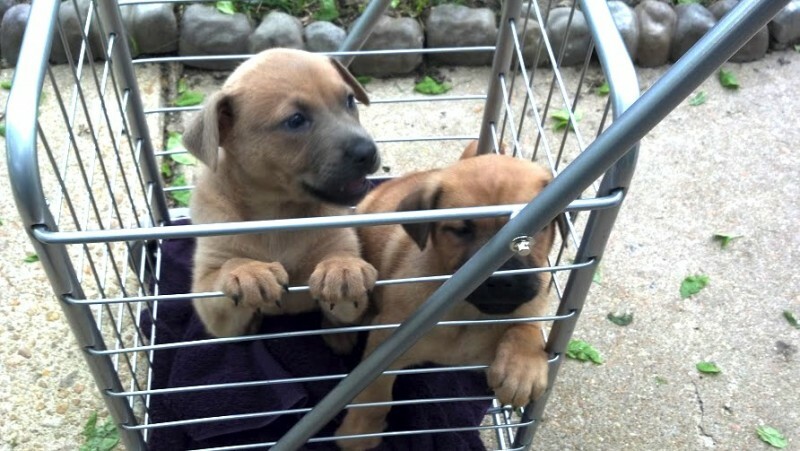 What a great idea a shopping cart is for puppies. 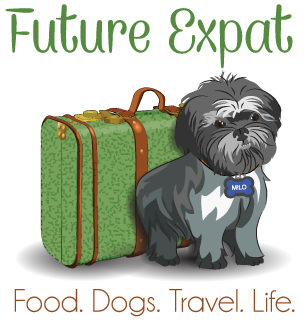 M used to have a doggie about 25 years ago, and she learned quite a bit by reading your blog. Now she just has cats cuz she’s older than dirt and says cats are easier. But she does miss having a doggie around. Brilliant idea! Shopping carts would be strong enough to take the pups too. Pawfect!